The road from Naxos town reaches Pirgaki after Aliko. The rather sinister look of the unfinished buildings cannot detract from the site's beauty. It is a small, green peninsula covered in bushes and cedars, surrounded by high sand dunes. Just before you get to Aliko take a left for Pirgaki, another lovely beach. There are a few tavernas, a large hotel complex and some hire outlets. Carry on along the road towards Ayiassos, which is a pretty sandy beach against a gorgeous backdrop. 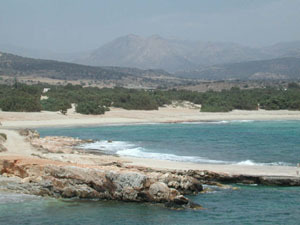 There is a direct road between Naxos town and Ayiassos.